I bought a bubble machine! Aw! I love it! I want one! Such a cute idea! Bubbles always make everyone smile! Great idea and yes, bubbles always makes everyone smile! love them. you - and bubbles! - are wonderful. oh wow! that looks like great fun! heehee... I love it. I wonder if the bubbleness cleaned any of the pollution! hey, it's almost a community service! Sweet dealyo, Katie! So fun. I've always wanted a bubble machine! So much fun. You leaping in the air + bubbles would be utter cuteness. Never a dull moment. NEVER a dull moment. Oh I want that too ! so bad !! Too cute !! That's it....I'm sending you and your bubble machine an invitation to my wedding!! Hooray! it makes me feel so very happy!!!! thanks for sharing your sunshine! I love your happiness. I have been wanting a bubble machine. If not a bubble machine, at least a bottle of bubbles. I think this just inspired me to finally go out and buy some. I think you're amazing... such a breath of fresh air!! I bet those out and about were so surprised! How fun! Awesomeness! I had forgotten that those things existed. xD Great pictures. I love it! You never fail to make me smile! You obviously have learned an important lesson - it is never too late to have a happy childhood. I am thoroughly enjoying getting to know your blog. I once did something like this at school! beautiful! I always look forward to your wonderful photos...they brighten my day! Hi there ! love your photos and posts! :) What camera do you use? i am so happy i found your blog lalalala!! yours is always a bright bright little corner in my world! love it! (which i suppose makes it only fitting that i'm passing the 'blog lovin' award onto you! visit my blog for a looksee. ah, i had a bubble machine when i was younger! 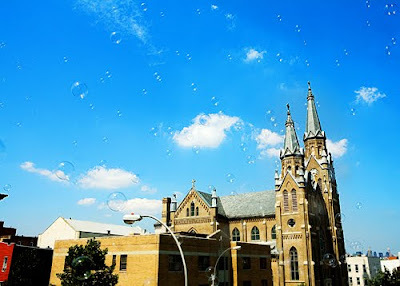 I love bubbles, and I would love to have a machine that makes them. How cool, a machine that will sit there and spit out rainbow colored balls of joy. How much fun! What a great thing to do. You inspire me! I love your art! you seem to be the perfect person to own a bubble machine! you do so much good with it! i love your blog. i always look for it when i need a special kind of cheering up! thank you for it! haha! lovely! i think this might have been the first thing to make me smile today! HA! My birthday was a few weeks ago and I was given lots of bubbles - now I always have a bottle of them ready to go on my porch...in north Greenpoint, glad to have a fellow bubbler close. Oh wow, I think a bubble machine might be the definition of fun! What a lovely idea. I put a link to your blog on my blog. I'm a new blogger, looking for other blogs to read. Yours made me smile, made me feel good and your creativity is such fun. Thanks! I've just hit the follow button. 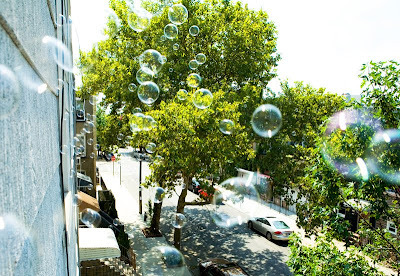 If only each bubble was truly filled with a burst of happiness! Imagine how many people you would've made smile that day! I heart your blog. Its been linked at mine so I can remind myself to visit as often as possible! you always put a smile on my face! Have a great weekend! Bubbles! 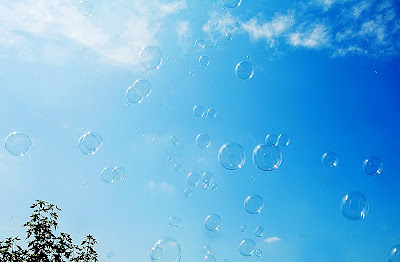 There is nothing that represents light-hearted happiness better than bubbles. :D Your pictures are very beautiful. 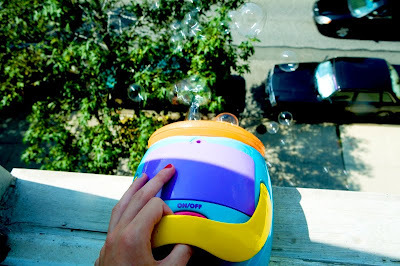 I have been looking for a good bubble machine for sometime now.. Can you pls let me know where you got yours from? Thanks!